Maybe it’s just me, as one who is heavily invested in minor league reports and analysis, but the news in the past week that some of the game’s rising new talent has got me especially excited about Opening Day. 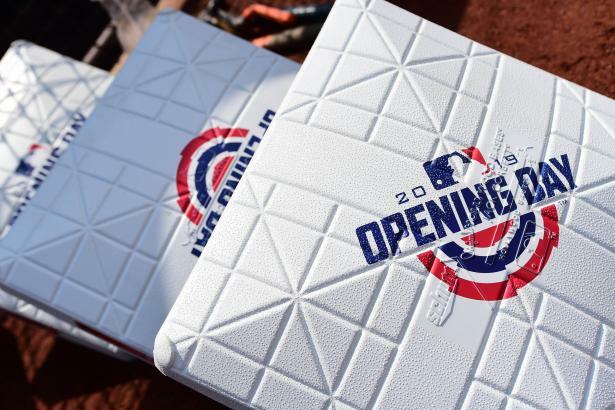 Fernando Tatis Jr., Eloy Jimenez, Chris Paddack and Pete Alonso will be among the rookies trotting out to one of the baselines today during Opening Day ceremonies, and players like Vladimir Guerrero Jr., Nick Senzel, Kyle Tucker and Forrest Whitley won’t be far behind. Add them to the cadres of exciting young talent in the game today, and we’re all looking forward to a great 2019 season. In the past several years, we’ve used the GM’s OFFICE space here on Opening Day to give a quick rundown on most of our in-season content. By now, almost all of us have our teams drafted (anyone else drafting this weekend, like me? ), most of our lineups are secured for the short week, and we’re ready to go. Now our biggest challenges is team management; guiding our roster through the injury and slow-start minefields, adjusting to the changing players and situations, all with an eye on how that late-summer contender can turn into an October champion. And so we aim to refresh (for the long-timers) and educate (for our first-timers) what to expect from BaseballHQ.com’s in-season coverage. Before we dive into all the features, both returning and new, there are two overarching ground rules to remember. First, all of these features here at BaseballHQ.com have some overlap. Within any column, most authors try to balance both the near-present expectations with the future. The line between now and later isn’t always as black and white as we would like, and as you may have seen at times in the preseason, there are instances when our writers may have a different take from each other. We continue to claim that is a feature, and not a bug—we have a collection of 40-something writers and analysts, and it's only natural that there will be some different opinions on player performance. That's just what happens when we gather the best minds. Second—related, though perhaps more importantly—our goal throughout our content line is not to spoonfeed answers that nourish your fantasy championship. Instead, while we hope all of our content is clear, rational and actionable, it’s more important to us (and beneficial to you) to “teach you how to fish.” The best way to consume our content is to take our conclusions and insights, and then overlay them with your own league dynamics, formats and idiosyncrasies. You know your league best, and that's why we put so much emphasis on process—so that you can utilize our tools and adapt them wisely to whatever fantasy baseball setting you are in. The flexible approach makes the journey of managing a competitive team all the more rewarding, no matter what your finishing place in October. So both for subscribers (and potential subscribers) what follows is an in-season roadmap to the vast amount of content here at BaseballHQ.com, and how to make it work for you at various stages though the season. We’ll try to use some real-life examples in a Q-and-A format to show you were to look, and when to look, for all your team maintenance needs. Onward! There’s more where this came from to help you win your fantasy league in 2019. Take the title home with a subscription to BaseballHQ.com. Q: With Steven Souza done for the season after his knee injury Monday, who is going to scoop up his AB in Arizona? A: All of our MLB transaction analysis happens daily under our PT TODAY column—under the "NEWS" menu. To be clear, PT stands for “Playing Time,” which forms the backbone of our projections here on the site. Each MLB team has a Playing Time Analyst, who is responsible for setting percentage projections for each position. Their work, updated as often as necessary, can be found on the Teamview pages under the "TEAMS" menu, then Depth Charts. For example, here is the Arizona chart, so you can see just how much AB or IP (in percentages) we allot to a player. In addition, these Analysts are responsible for taking the relevant news of the day as it relates to playing time for their team(s), and annotating it for readers, showing their work. Each morning, the previous days’ notes are collected in the PT TODAY column. And here is Wednesday’s column that discusses Arizona's outfield situation. Two important corollaries: First, PT TODAY is not a replacement for a newswire. Here at BaseballHQ.com, we don’t break stories; there are other sites/services for that. What we do focus on is analysis of the news, and how it will affect a fantasy team. Second, we only write up stories that affect playing time. You probably won’t read about (in theory) Max Scherzer's brilliant new pitch here, as that news would not affect how many innings we think he will pitch this season. But PT TODAY is where you find the analysis of how the Souza injury affects the other ARI outfielders. And by the time you read this PT TODAY column every morning, those PT% changes have been incorporated into our site-wide projections file. Q: What about Luis Severino's injury? How long will he be out? A: Our thrice-weekly column THE BIG HURT (also under "NEWS" menu) provides the answers to questions as simple as these, as well as complex as describing a heel laceration/debridement (here's looking at you, Miguel Sano), and gives realistic guidance on how long a player might miss. In addition, it examines how the injury might affect him when he returns. It started this week, and it's where you can read about Severino, Sano, Justin Upton and more. Q: I’m playing DFS or I’m in a daily transaction league. You guys have the daily lineups? How do I tell who the best starting pitcher plays are for today’s MLB games? A: For lineups, you'll want to frequent our DAILY DASHBOARD page (under the TEAMS menu), where batting orders are posted as they become available for that day's games. There's also links to pages with park factors, team indicators, our PlayerLink database and that day's starting pitching report. The companion piece to the starting pitching report is our revamped pitcher start ratings in our DAILY MATCHUPS column (see the Opening Day version here). You can find DAILY MATCHUPS under the NEWS menu. Note that while the DAILY MATCHUPS page gives that day's starts ranked by overall score—and broken down into three tiers—you can also visit the native Pitcher Matchups Tool, which not only gives an overall rating for the start, but also a rating in terms of Wins, Ks, ERA and WHIP that are sortable. So, later in the season, if you're trying to add strikeouts, you can use this tool to sort by potential strikeouts for pitcher on a given day to help make your selections. In addition, you can also view this in an eight-day scan, especially helpful for those two-start weeks. Q: Speaking of which ... I’m in a weekly-transaction league, and pitchers with two-start weeks are valuable. Is there any tool to help us set our rosters at the beginning of the week? A: Indeed—our DOUBLE DIPPIN' column which does exactly that—gives recommendations for the best two-start pitchers of the Monday through Sunday week. The column appears every Sunday (its debut is in three days) and like its DAILY brethren, leans heavily on our Matchup scores. The column points to the tool, which has a rolling eight-day scan useful no matter when your scoring week starts. Q: Why don't you guys do this for hitters? A: Umm, well, starting this Sunday, we're dipping our toes into those waters. Ryan Bloomfield will be presenting some reports and data in that direction this week, and we may well also add some written commentary eventually. We hope to make use of the Pitcher Matchups Tool, along with things like park factors and platoon splits to help set our hitting lineups for the week. We'll be asking for your feedback along the way, especially over these first couple of weeks. Stay tuned!! Q: Who the heck is Pablo Lopez? And does he matter for my league? A: Any and all rookies that are placed on the 25-man roster who have rookie status get written up in our CALL-UPS column (SCOUTING menu, current column here). Several writers who cover the minor leagues give a quick scouting snapshot of each player, some relevant stats and our player ratings, seven days a week. The reports are comprehensive enough on both their scouting details as well as some probability as to current and future role. This week’s column will be one of the season’s longest (September roster expansion week being the other); last year it included 74 names that were rostered on Opening Day. We populate that list throughout the first several days of the season. The writeups remain there for a week, and a new column gets created every Tuesday morning. The Call-ups profile also become a permanent part of each player’s PlayerLink page. Long-term readers rely on the CALL-UPS for all their rookie needs. As subscribers have stated in the past, “Call-ups columns are why I have a BaseballHQ subscription.” We’ll leave it at that. Q: I don’t trust Pedro Strop to remain the Cubs closer—he's had injury issues the past two seasons and just isn't stable there. If he would fail, who is next guy Joe Maddon is likely to call on for saves? A: The stark reality of fantasy baseball is that the opportunity for player stats gets decided by the MLB manager. He stays with the veteran slugger who can’t hit lefties, gives the quick hook to the rookie hurler who comes out with first-game jitters, or refuses to use his closer in a tie game in the eighth because it’s not a save situation. All these decisions happen on an MLB-team level. So we address questions like the above with our PT TOMORROW column, where a staff member is dedicated to knowing one MLB division, inside and out. Six days a week, the purpose of the column is to look ahead on the team level, asking questions such as: If a certain starting player heads into a slump, how likely would he get replaced—and just who would replace him? Knowing this information ahead of time can be a fantasy goldmine, as you can be prepared if these situations happen. PT TOMORROW is a vitally underused resource, and can be found six days a week, one division per day (Sundays off), under the NEWS tab. Q: Who is the next minor leaguer to be promoted that can help my fantasy team? A: While PT TOMORROW might give you a clue, our weekly WATCHLIST column is made just for this question. WATCHLIST (SCOUTING menu) scours the high minor leagues for players who, by a strong performance or a shaky MLB player in front of them, could be just a few days or a week away from getting the call. Knowing who the candidates are give you time to consider rostering them now, depending on your league rules, rather than wait until they hit the majors. Every year, this is a coveted column and informative way to cover the minor leagues. Last year, one April column covered Danny Jansen, Shane Beiber and Ty Buttrey, several months before each became an MLB factor. Many of the subjects are not on top prospect lists, but have the ability to contribute. The WATCHLIST starts up again in mid-April. Q: My starting pitching is questionable—OK, if I'm being honest, it stinks. Who should be some names I should target for an upgrade? A: This question is perfect for our BUYERS GUIDES, our skills-based columns that attempt to recognize trends and give you some actionable options. BUYERS GUIDES (under SKILLS menu) look at a player’s skills more than his current role to find those due for a performance spike or swoon. While you’ll be disappointed if your look at these columns exclusively as a free agent target list, these will give hints on who to target and who to keep. Some players could be available in your free agent pool, but some likely are not, but more importantly, the column gives you criteria to look for in doing your own analysis. You’ll become familiar with what skills and metrics BHQ writers use to identify players ready to take the next step up. Each of the three columns run weekly through the season, and because they are filtered by position, you can quickly find STARTERS, BATTERS and RELIEVERS. Current-year data will start very soon (with appropriate small-sample caveats). Q: I’m at a place to take a longshot on a player, even if it’s risky. Do you have recommendations? A: The SPECULATOR column (RESEARCH menu) is designed especially for this purpose. We call this our 20% plays—explorations with the “What if?” meter fully engaged. The weekly column runs on Wednesdays and is centered around a different theme each week. We try to strip away our preconceived notions, discard our blinders and ask “What could happen?” We’ve seen the “bold prediction” columns all over the internet this (and every) spring. This column takes that idea, but stretches it out all season long. It's a place to try and predict the surprises. Q: The date is May 1 and Byron Buxton has 5 HR and 7 SB. Is the wait FINALLY over? A: This is where our popular FACTS & FLUKES column comes in. F/F (SKILLS menu) is our place for long-term performance evaluation. Sure, you can use these profiles for roster management, too—do I keep or dump Belt?—but the F/F focus is where the player’s stats are likely to settle by the end of the season. Each column examines five player’s individual skills history and takes into account larger sample sizes than just about anywhere else on the site. These columns have been running in season-preview mode for months, and since Opening Day has hit, we are cutting these back to 1-2 per week for most of April. The reason? Small samples are our enemy in long-term analysis, so we're cutting back F/F until after four weeks of play are completed, when we'll incorporate 2019 stats and then the focus will be the remainder of this season. But whatever the player has done to this point, the guide question is, “Is the current performance sustainable?” FACTS & FLUKES runs five days a week, and the special F/F SPOTLIGHT—where we take just one player and go even deeper, asking the same questions—starts in the first week in May. Q: What minor leaguers are worth rostering in my farm system? A: BaseballHQ.com’s team of scouts bring you coverage of the minor leagues, both on a larger scale, where we discuss statistical leaders, and a micro scale, where we dive into the strengths/weaknesses of several specific players. Our weekly EYES HAVE IT series (SCOUTING menu) give you the scoop on the youngsters on the rise, with detailed scouting reports that differ from other sites, since BaseballHQ.com always has fantasy baseball production in mind. We're expanding the number of these columns this year, so most weeks will have two columns on field-centered reports per week. As always, our rankings and ratings make the fantasy adjustment for you. EYES HAVE IT runs on Thursdays, and today’s article gives some advice on the Opening Day rookies. If your league has a farm system, BHQ will give you plenty of information throughout the season to help strengthen it. Q: What about site news, broader fantasy baseball trends, or other non-player specific information that could be helpful to running my fantasy team? A: This column, GM’s OFFICE, normally runs every Friday, with pieces from co-GMs of BaseballHQ.com Brent Hershey and Ray Murphy. Topics might include an industry league wrap-up, trade discussions, new features on the site, or any number of topics. Q: I love the numbers. What new metric I should be considering when doing my own player evaluation? A: New tools and metrics have been a hallmark of BaseballHQ.com for as long as we’ve been in existence (for more than 20 years!). That tradition continues with our weekly RESEARCH pieces, where writers present imaginative cutting-edge tools that aim to help us all get better at player evaluation. Many of these will have long-lasting impact and become a permanent part of the BaseballHQ toolbox. As with all other aspects of BHQ coverage, the fascination is not just the numbers themselves, but how these numbers and measures can help you win your fantasy leagues. Q: So, like, how do I find all the new content every day? A: Several ways—probably the easiest is to log on to the home page, BaseballHQ.com. The most recent articles scroll through the slideshow on the home page. Visit that every day, and you won't miss a thing. One good way to catch up if you've been away for a few days is to click on our "Recent Headlines" by-day links in the orange bar right below the slideshow. Or, a third way, for those on Twitter, is to follow @BaseballHQ. All of our article links are tweeted out through the day. As always, if you anyone has comments/questions/suggestions, leave them below. Let’s Play Ball!